Our Easy Mount Grab Bars provide something secure support to assist you in any room in your house. While other bars have standard three hole flanges, the Easy Mount Grab Bar has 9-holes, which means greater versatility during installation. The extra holes provide mounting options for angled grab bar installations, and for areas where stud spacing may vary from 16” centers. It is easy to add an additional mounting screw for peace of mind. Flange covers conceal the screws for a simple and modern finish. A common grab bar configuration for bathtubs is a vertical grab bar at the entry point, and a horizontal grab bar along the back wall. 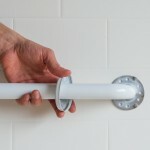 We offer various lengths of grab bars to accommodate for stud spacing and bathroom layouts. We recommend that grab bar mounting screws be inspected and tightened on a regular basis. *THIS PRODUCT IS SHOWN IN WHITE. IT IS ALSO AVAILABLE IN KNURL.